Explore housing styles of Indians from Kansas. The teaching materials include reproductions of Indian artifacts, photographs and drawings, models of three historical housing styles, books, and lesson plans. The lessons reinforce the use of natural resources in building a house, adaptation to the environment, and change over time. 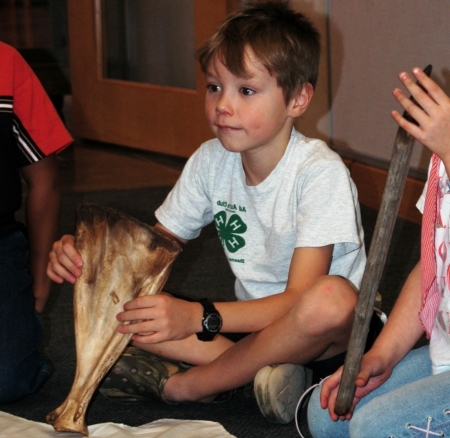 The eight, first grade, lesson plans emphasize hands-on learning and reading while exploring the topic of Indian homes in Kansas. Use scale models of three historic housing styles, reproductions of historic tools, and a large floor map of Kansas to learn about the environment and natural resources related to each type of housing. Sentence strips and picture clues reinforce information they are learning and provide the foundation for comparing the three housing styles. Books offer an opportunity to explore change over time. Insure for $500 when shipping. The Kansas Historical Society developed the Indian Homes in Kansas traveling resource trunk with major funding provided by the Westar Energy Foundation and the Kansas State Department of Education. Return to Traveling Resource Trunks page.